Description: GTW GP38AC 6216 at BRC's Clearing Yard in Bedford Park, Chicago, Illinois on February 5, 1988, Kodachrome by Chuck Zeiler. 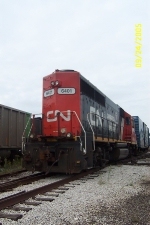 Description: CN(GTW) GP40# 6401 switches CN's Tunnel yard at Port Huron. Description: CN Operation GP40 6401 leads a Flint-Durand local around the High Wye. Description: CN 6401 shows off it's OLI Paintscheme. Description: CN 6401 has just crossed the diamonds and is backing into Durand yard. Description: Grand Trunk Western #6401, the last straight GP40 on the GTW Roster, sits on the shop lead in the Durand Yard. The locomotive, and two Highcube Box Cars were part of a display for The 100th Anniversary "Celebration" of the Durand Depot. Description: Another view of the 6401. This is a former DT&I Unit. Description: A look at the cab of the 6401. 6401 was repainted into CN Colors in the Early 1990s, and is lettered for Operation Lifesaver. The locomotive can normally be found working a local train on a Spur in Port Huron, Michigan, along the St. Clair River. Description: Southbound approaching Sixth Street. Description: Northbound on the CN Centralia Sub. ~ Nice central air!!! Title: I don't know what the model of this is, and ntiether do the archives. Description: CN 243 heads around the high wye to set off the 4 cars he brought from the south.